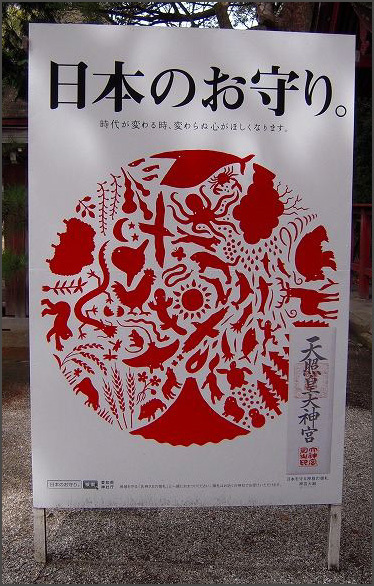 Chiten, Jiten 地天 "Earth Deva"
. Ta no Kami 田の神 God of the Fields . 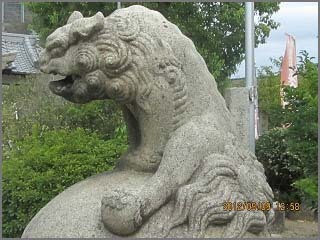 Ji-ten, whose name means "earth deva,"
guards the downward direction and is the god of the earth. He is also called Kenro chijin. On the more down-to-earth animistic beliefs of rural Japan, he comes as Yama no Kami and Ta no Kami, the God of the Mountains and the Fields, who changes his residence twice a year, retreating in autumn to the mountains and coming back in spring to the fields. This is a fascinating tale of its own. In Shinto, when a mountain is considered an object of worship, a yamamiya may be established at the summit or on the side of the mountain, as at Sengen Jinja on Mt Fuji. 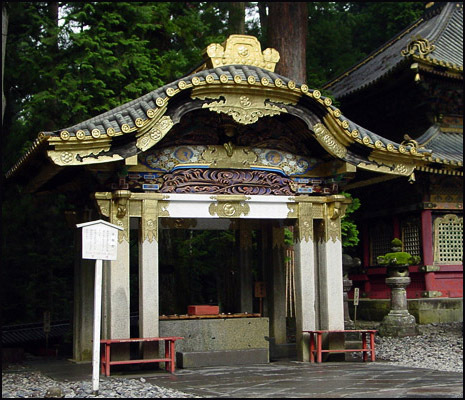 In some cases, the yamamiya may be regarded as an "interior shrine" (okumiya) in contrast to a shrine located in a village (see satomiya) or lower on the mountain. Some scholars see the yamamiya associated originally with ancestor worship, and thus also with the dual complex of mountain god (yama no kami) and rice field god (ta no kami).
. Kenroo chijin 堅牢地神 Kenro Earth Deity . Guards the downward direction; god of the earth. 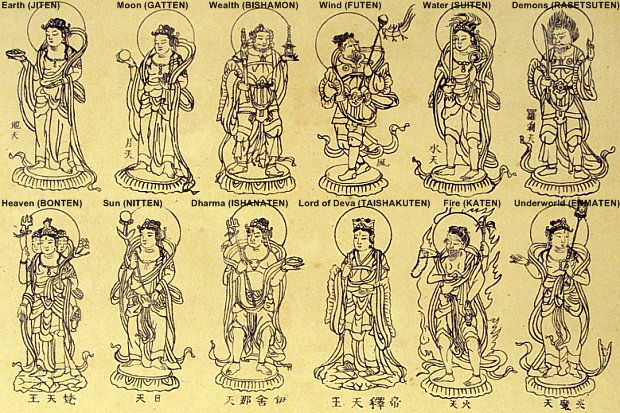 Jiten's counterpart is Bonten (Brahman), who guards the upward direction.
. 風水天地の神様 Gods of the four elements - wind, water, heaven, earth .
. Yama no Kami 山の神 God of the Mountain - Legends . Jishin san 地神さん is venerated on the festival day of Yamanokami. He gets offerings of 大根の初物 the first radish.
. jigami 地神 / ジガン Jigan (in the local dialect) . jigan 地眼(地元) "eyes of the land"
At the graveyard, a bluish fire-light was seen every night. The villagers were afraid, thinking it was the soul of a villager and did not even dare to pass the road during daytime. 玉吉 Tamakichi wanted to see it for himself and went out one evening, carrying 地神の魂の扇 a hand fan with the soul of the Jigami in one hand. When he reached the graveyard, he could see the bluish light. While fanning with his hand fan he went closer. The ground of the grave was still fresh so Tamakich started to dig, found the coffin bound with a cord and pulled it up. But it was not a coffin but a hookei 包茎 (the dictionary says: a phallus with phimosis). here is another version of Tamakichi and jishin no oogi 地神の扇 the hand fan of Jishin.
. Shinto purification misogi 禊 and rituals . temizu 手水 (purification of hands and mouth) performed by a Shinto priest. At all Shinto shrines, worshippers and casual visitors are asked to purify themselves (Harai 祓い) of impurity before praying to the Shinto deities. The act of cleansing is called Misogi 禊 or Misogi Harai 禊祓い, and the actual washing of hands and mouth with water is called Temizu 手水. or by standing underneath a waterfall cascading at freezing temperatures.
. torii kuguri 鳥居潜り walking through a Shinto torii gate . 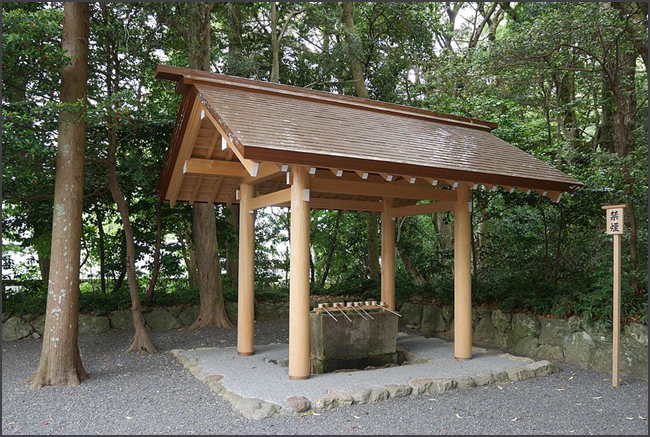 Walk toward the hand-washing basin (手水 choozu) and cleanse hand, mouth and mind.
. Shinto Shrine Composition . 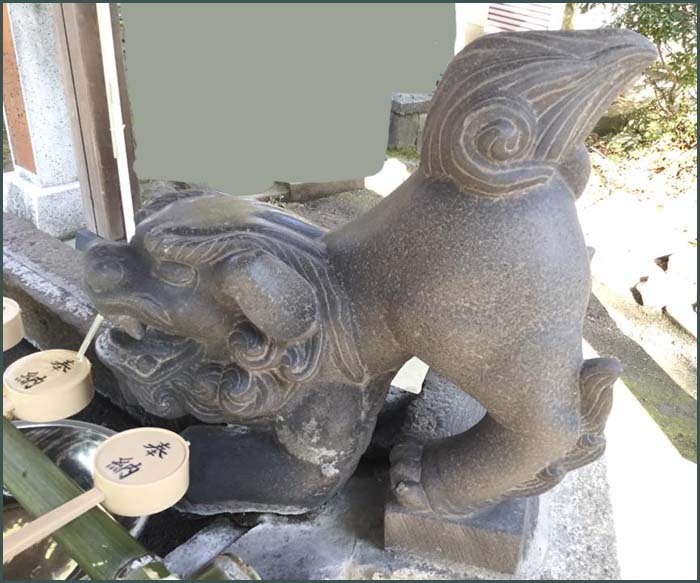 The sprout is often in the form of a dragon, but other animals, venerated in a shrine, can also be found.
. Water Sprouting Dragon Head 龍の口から水の出る手水鉢 . A place to one side of the approach to a Shinto shrine where visitors perform purification rites, including rinsing the mouth and washing the hands. Often a large rectangular basin or cistern is used to hold the water. 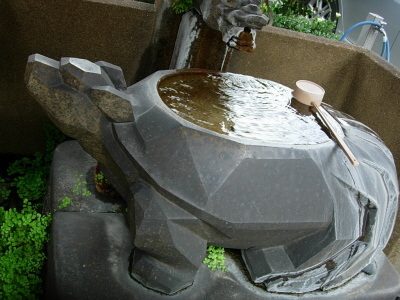 A pipe supplies the water with a continual stream at one end. The pipe is sometimes concealed by a dragon's or snake's head. The mitarashi has a roof but the sides are open. Varying styles and degrees of elaborateness characterize this type of shelter. If a stream or river flows nearby, as at Ise Jinguu 伊勢神宮, it is used as the place for purification and is called mitarashigawa 御手洗川 (a river for purification rites).
. Naiku Inner shrine complex of Ise 伊勢神宮内宮 . 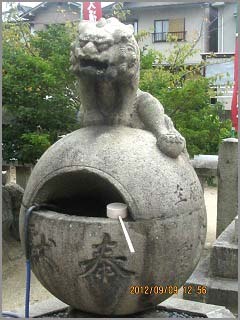 (手水舎, purification trough) at Uwase Jinja (宇波西神社).
. Shrine Uwase Jinja 宇波西神社 . 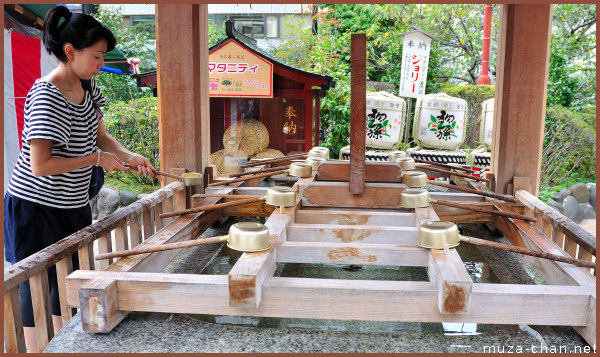 When entering inside a Shinto shrine, the visitor should perform a symbolic cleansing called temizu (from te “hand” and mizu “water” - water to purify the hands). This purification is considered indispensable before visiting the sacred area and it signifies the removal of evil and pollution. 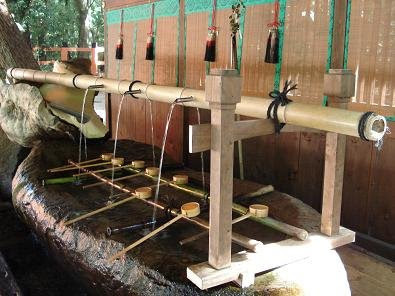 For the ritual, every shrine provides an ablution pavilion - chōzuya or temizuya - usually a stone basin filled with clear water, with wooden ladles. Take the ladle with your right hand, fill it with water and pour some water to rinse your left hand. Then, move the ladle to your left hand and pour water over the right hand. Now, you take again the ladle into your right hand, cup the left hand, pour some water into it and use it to rinse your mouth. Finally, repeat the rinsing of the left hand and place the ladle back.
. mitarashi dango 御手洗団子 rice dumplings after hand-washing . Shrine Shimogamo Jinja in Kyoto 京都の下鴨神社. There are quite a lot of haiku about the ritual ablutions before visiting a Shrine.
. Kifune Shrine 貴船神社 Kibune Jinja . Often also in a the compound of a tea ceramony house. 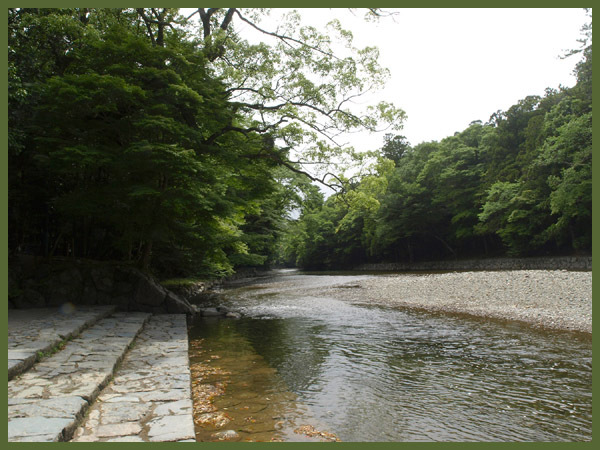 kawatemizu, kawachoozu 川手水 "river to wash the hands"
Issa had spent the night in Suzaka (Nagano) at the rich merchant Tanaka family 田中本家 in 1823 and felt quite refreshed. 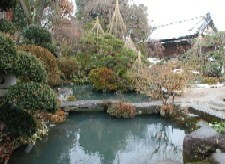 The garden with a large pond ant the mountain in the background had been designed by a gardener from Kyoto. Now there is also a Museum 田中本家博物館.
. Kobayashi Issa 小林一茶 - cultural keywords .
. Yosa Buson 蕪村 and the Edo policemen .
. Shitenno-Ji - 四天王寺 Osaka . 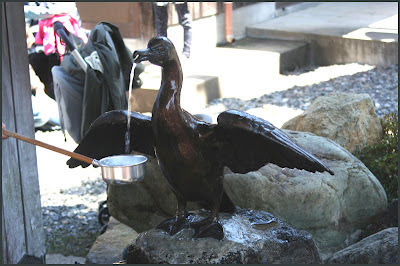 If you pour water from the hand basin over your self, you will make a good career.
. Chanoki Inari 茶の木稲荷 / 茶ノ木稲荷神社 Inari and the Tea Tree .
. chinju doo 鎮守堂 Hall for the Regional Kami . The oldest Buddhist statue in Japan with gems inset in its eyes.
. Choohooji 頂法寺 Choho-Ji .
. Choorakuji, Chōraku-ji 長楽寺 Choraku-Ji temples . - - - - - Shimoda, Kyoto, . . .
. Chootokuji 長徳寺 Chotoku-Ji .
. chigi 千木 "1000 roof beams" .
. chinjugami　鎮守神 tutelary deities .
. chinowa, chi no wa 茅の輪 sacred purification ring .
. Chokusaisha 准勅祭社 Jun Chokusaisha - Imperial Shrines .
. chuukei 中啓 Chukei, ceremonial fan of a Buddhist priest . A kami acting as a tutelary of a circumscribed geographical region or area of land. Believed to have originated with the qié-lán-shen (Jp. 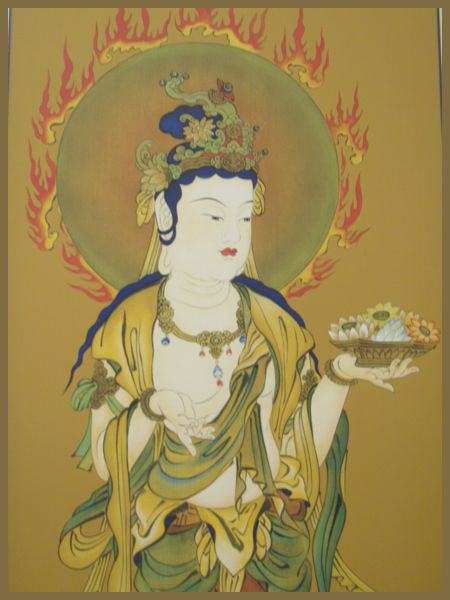 garanjin　伽藍神), tutelary deities of temple compounds in China, the growth of kami-buddha syncretism (shinbutsu shūgō) led to the dedication (kanjō) of various kami within the precincts of temples in Japan as well. Kasuga Myōjin at Kōfukuji (Nara). Based on this practice, kami were later dedicated as tutelaries of the nation and palace, followed by tutelaries of provinces and castles, and even noble manors (shōen) and domains. 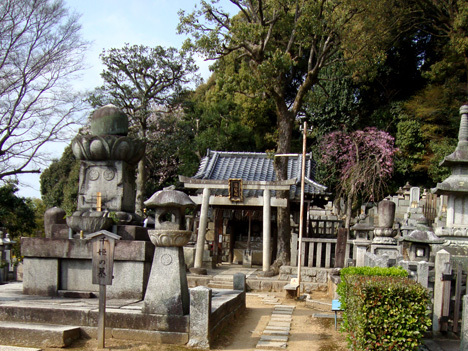 Some of the guardian kami thus dedicated included the Ise and Kamo shrines as tutelaries of the nation and capital, and the Ichi no miya shrines as provincial tutelaries. As tutelaries of shōen estates, various kami of the capital region were selected for their deep ties to the noble proprietors of such estates, while the Sannō Shrine (present-day Hie Jinja) was dedicated by Tokugawa Ieyasu as a tutelary of the shogun's castle in Edo. In other cases, kami were dedicated as the protectors of the homes of individual families. These tutelaries were originally selected for their characteristics as powerful kami with the ability to subdue local indigenous land spirits, and make them subject to the new resident, with the end of providing safety to the region and its occupants. 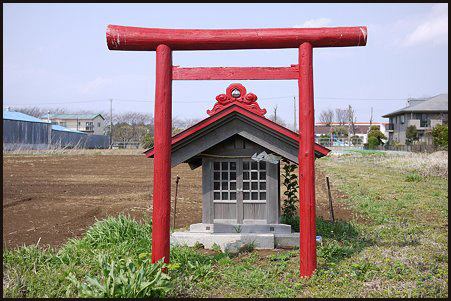 With time, however, such dedicated outside tutelaries became confused with the indigenous local land spirits themselves, so that from the medieval and particularly in the early modern period, a wide variety of shrines with differing lineages and histories came to be broadly known as village chinjugami. In some cases, shrines originally dedicated by local gentry families rose to the status of clan kami (ujigami), and thence came to be celebrated as chinjugami of all people living within the geographical village; in others, the development of new land would be accompanied by the dedication of a shrine as the ubusunagami 産土神 (residents' tutelary) for the occupants of the new land, and that kami would subsequently come to be called the chinjugami of the newly developed geographical area. Such trends were furthered by the government's system of temple registration (terauke) during the early modern period; under this system, shrines were placed under the management of Buddhist temples, with the result that many shrines came to be viewed as the chinju of the associated temple. Through this process, chinjugami came to be viewed as little different from ujigami and ubusunagami, and the chinjugami came to be worshiped as a divine tutelary of all the people living within its realm. This is the significance of the term chinju no mori ("grove of the chinju") which is used to describe the groves of trees at modern Shinto shrines.
. WKD : place where I was born, ubusuna 産土 . The place where a baby is born and gets its first clothes (ubugi). There the local gods live (ubusunagami 産土神), who protect the baby. In haiku, it can therefore carry a lot of meaning. This group tries to bring people together in the local shrine to practise exercises for health, breathe the fresh air and relax to improve wellbeing. CHINJU-NO-MORI is a place to give a prayer of gratitude to nature which has been providing bread of life for the Japanese from ancient times. Our goal is to make best use of the grove as a place to form a bond between people as well as people and nature, and to pass down toward future our ‘wisdom’ and ‘tales’ cherished over time and also ‘heart’ and ‘space’ to show thanks to nature. 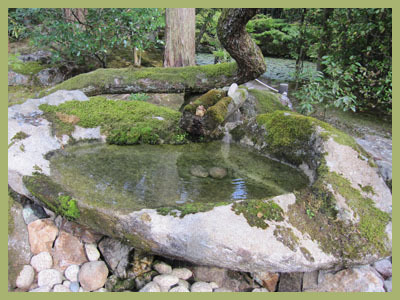 Trying to locate the various shrines and temples where Shiki wrote the following haiku. If you know any location, please add it as a comment to this entry. in Higashiyama-ku, Kyoto, Japan is the headquarters of the Jōdo-shū (Pure Land Sect) founded by Hōnen (1133–1212), who proclaimed that sentient beings are reborn in Amida Buddha's Western Paradise (Pure Land) by reciting the nembutsu, Amida Buddha's name. 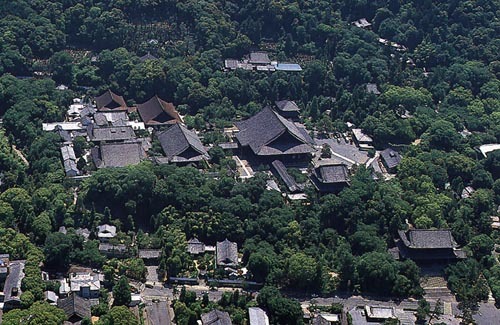 The vast compounds of Chion-in include the site where Hōnen settled to disseminate his teachings and the site where he died. 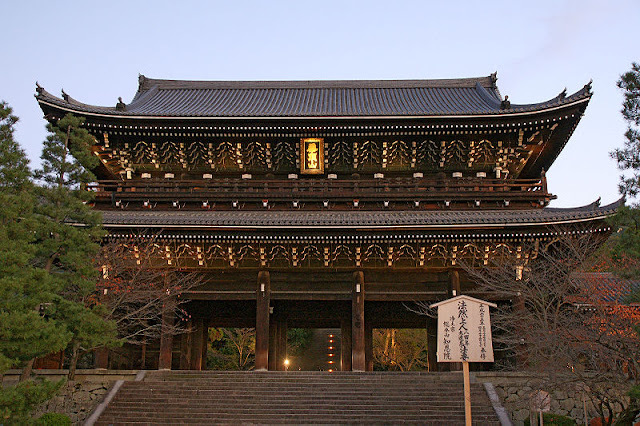 The colossal main gate, the Sanmon, was built in 1619 and is the largest surviving structure of its kind in Japan. Chion-in has a large and small guest houses in the irimoya roof style called Ohojo and Kohojo that are designated Important Cultural Heritages. Both guest houses were built in 1641.
. Hoonen Shoonin 法然上人 Saint Honen and the Gyoki ceremony 御忌 .
. Otagaki Rengetsu 太田垣 蓮月 .
. Masaoka Shiki 正岡子規 visiting temples . 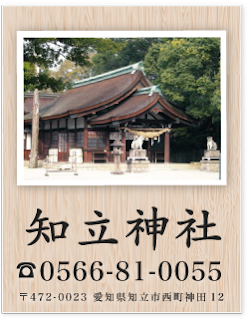 This famous shrine has a long history of more than 1000 years, being founded by Keiko Tenno 景行天皇 as one of the two important shrines 三河国二宮 of the Mikawa region. 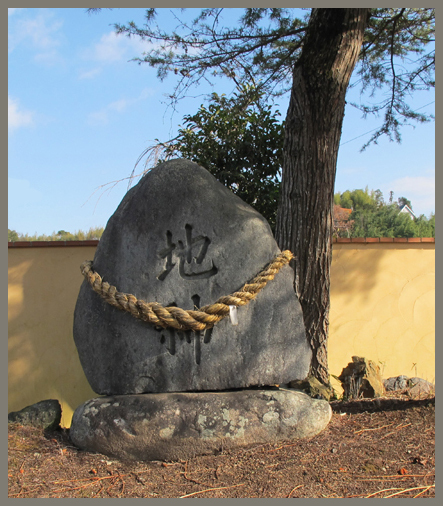 During the Edo period, it was one of the three great shrines along the Tokaido Road 東海道三社. amulet against bites of poisonous snakes (mamushi yoke まむし除け ). amulets for the safety of State and Family （kokka annei 国家安寧) (kanai anzen 家内安全). Two performers with shamisen and drums recite the story, while two puppets with three performers each act the movements. They have quite a few puppet plays in the repertory.
. Bunraku　文楽　and Joruri　浄瑠璃　.
. dashi 山車（だし）festival float . Five floats are lined-up for main festivals held every other year. 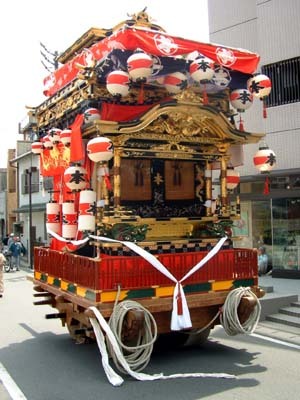 Joruri puppet shows and Karakuri Dolls, which are designated important intangible folklore cultural assets, are performed on the floats. 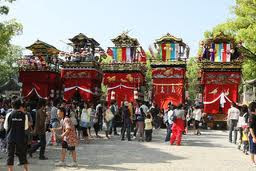 The Chiryu Festival, which is a festival of Chiryu Shrine, is a major seasonal tradition duringn the summer, and the main festivals and interval festivals take place every other year on May 2 and 3. 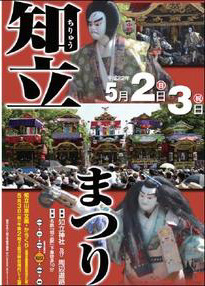 The festival has a long history and has been held since the Edo Period (according to “Naka-cho Festival Records” for 1653), featuring the float Bunraku/Karakuri Dolls performed on the floats. The Main Festival brings in five huge floats of 7 m in height and 5 t in weight sent from five towns. It is spectacular to see the floats move forward in front of the houses with musical accompaniment called Kami-mai. 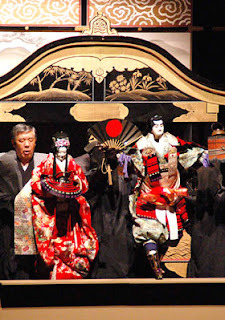 Furthermore, both the “Float Bunraku,” Joruri puppet show, and “Karakuri Dolls” devotedly perform on the float (national important cultural assets; the “Karakuri Dolls” used to be performed on the upper level, while the “Float Bunraku” was performed on the lower level. Currently, Nishimachi is in charge of Karakuri, while Yamamachi, Naka Shinmachi, Hommachi, and Takaramachi are in charge of Bunraku), are handed down from the Edo Period, and they are the basis of the vibrant local performing art. Floats consist of two tiers, and wheels are inner rings, which are slices of a huge pine tree cut into rings. The appearance may be similar to floats from the Chita region, but gold foil is used for carving, and the steering bars are located only at the rear, which makes these unique. Bunraku (Joruri doll show performed by three people) is performed in various parts of Japan, but it is only at Chiryu where it is performed on floats. 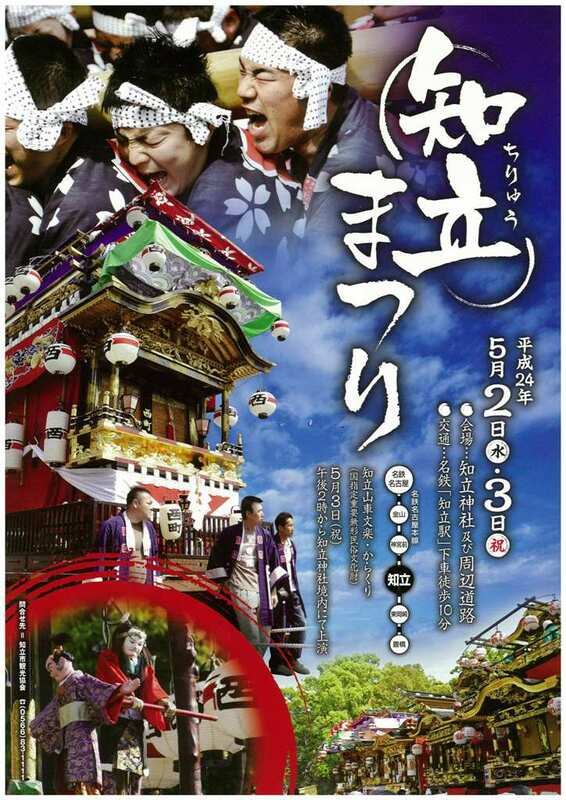 It began during the Edo Period (according to “Naka-cho Festival Records” for 1747) and has a history of 250 years. 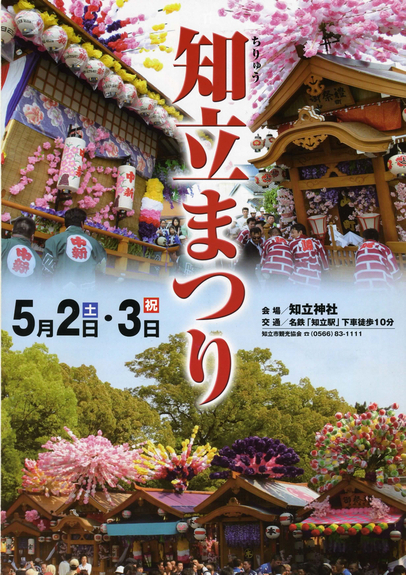 Currently, four floats from Yamamachi, Naka Shinmachi, Hommachi, and Takaramachi perform “Sanbasou,” “Keijo Awano Naruto,” “Yukenki of Tsubozaka Kannon,” “Shinrei Yaguchino Watashi,” and so on (since 2004). The Karakuri Dolls are shown in response to Joruri and are performed only by the dolls, which makes the performance very unique. Currently, “Ichinotani War” is performed. Karakuri Dolls are made by the local people with creative ingenuity, and the techniques have been handed down since the Edo Period (according to “Naka-cho Festival Records” for 1724). There are two ways to move Karakuri dolls: moving automatically via springs or spiral springs, and by moving via strings. Chiryu Karakuri Dolls are operated via the latter method and require highly skilled techniques.
. Kitami no mamushiyoke 喜多見のまむしよけ amulets against snake bite .